Chihuahua, Mexico • An out-of-control monster truck shot into a crowd of spectators at a Mexican air show, killing eight people and hurting 79, officials said. The driver was detained Sunday on suspicion of manslaughter and officials said they were investigating possible safety violations in the setup of the show. 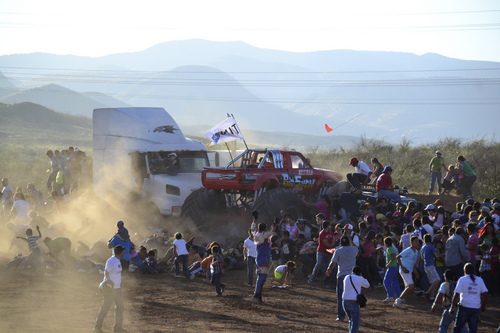 Carlos Gonzalez, spokesman for the Chihuahua state prosecutors&apos; office, said driver Francisco Velazquez appeared to lose control of the truck after leaping over cars it was crushing during a demonstration at the "Extreme Aeroshow" on Saturday. Chihuahua Gov. Cesar Duarte Juarez said his administration, which was listed as a sponsor of the air show, was investigating whether Civil Protection authorities had correctly enforced safety regulations. He and other officials didn&apos;t say if those regulations required any protective barrier for spectators. Some witnesses said the driver appeared to have hit his head on the interior of the truck, which is nicknamed "Big Show," as he drove over the old cars. At least two reporting seeing the driver&apos;s helmet come off before the huge vehicle drove into the crowd of terrified spectators, who tried to flee. The governor, who declared three days of mourning, said a test had detected alcohol in the driver&apos;s breath, but he didn&apos;t reveal the level found or say whether it violated any law. Associated Press writer Jose Antonio Sanchez reported this story in Chihuahua and Ricardo Chavez reported from Ciudad Juarez. AP writer Michael Weissenstein in Mexico City contributed to this report.